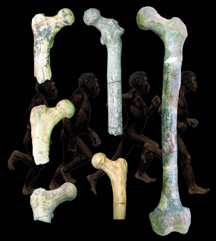 The shape of a fossil thigh bone (center) from Kenya shows that our early ancestors were already adapted to upright walking by 6 million years ago. Sometime between 5 million and 8 million years ago, an evolutionary divide occurred: some apes left the trees behind and adopted an upright form of walking. The two-legged, or bipedal, population formed the basis of the hominin lineage that gave rise to Homo sapiens and its close ancestors. To find evidence of the earliest human ancestors, scientists scrutinize fossils from around this time period. One such fossil, a 6-million-year-old thigh bone from a species called Orrorin tugenensis, is the topic of a new study published in Science yesterday. Despite previous examinations of this fossil, which was discovered in Kenya in 2000, researchers still debate whether O. tugenensis walked upright and whether it was more closely related to the australopithecines that lived 3 million to 2 million years ago or to the much later Homo. Brian G. Richmond of George Washington University in Washington, D.C., and William L. Jungers of Stony Brook University in New York write in Science that they have resolved the debate by determining that O. tugenensis did indeed walk upright and that its hip structure is more similar to the australopithecines. Richmond and Jungers based their conclusions about the species' bipedalism and hip mechanism on the shape of the thigh bone. Using calipers, they recorded many of the fossil's dimensions, and then compared their measurements through statistical analyses to various hominin and ape species. Determining that O. tugenensis was bipedal is significant, Richmond says, because it reduces the time window during which the hominin lineage could have originated to between about 6.5 million to 7 million years ago. The presence of not only bipedal but also more primitive tree-climbing traits in the species indicates that O. tugenensis is not far removed from the ape-human common ancestor but that it is "already in the human line," Richmond says. Robert Barry Eckhardt, an evolutionary biologist at Penn State University in University Park, says the study's findings that O. tugenensis was bipedal is not new: "[It] is just the same conclusion that my colleagues concluded on the basis of the very same evidence in 2001." Eckhardt says that the paper's hypothesis that O. tugenensis is more similar to Australopithecus afarensis than to modern Homo "may or may not be true," although he says the statistical data presented within the paper do not suggest that this is a strong possibility. Andrew T. Chamberlain, a biological anthropologist at the University of Sheffield in the United Kingdom, says that the study has quantitatively and convincingly established bipedalism in the specimen. The findings are significant, he says. Chamberlain agrees with the researchers that O. tugenensis shared a hip and gait mechanism with the much younger A. afarensis  such as the famed Lucy. As the femur "morphology is an early example of australopithecine," he says, it demonstrates that the hip mechanism was evolutionarily stable. He adds that more studies of A. afarensis might confirm this.